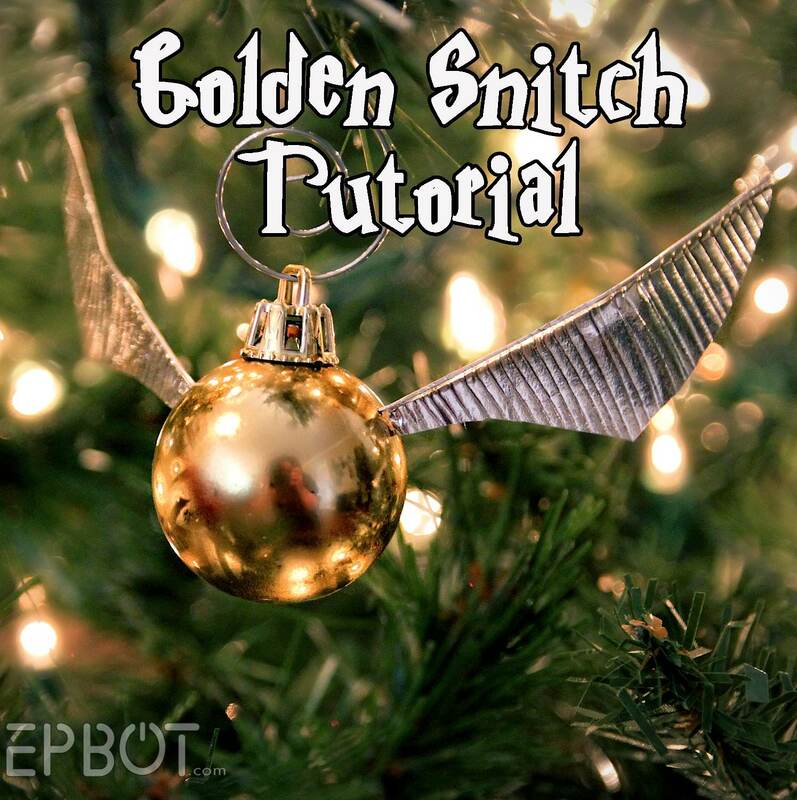 EPBOT: Make Your Own Golden Snitch Ornaments! 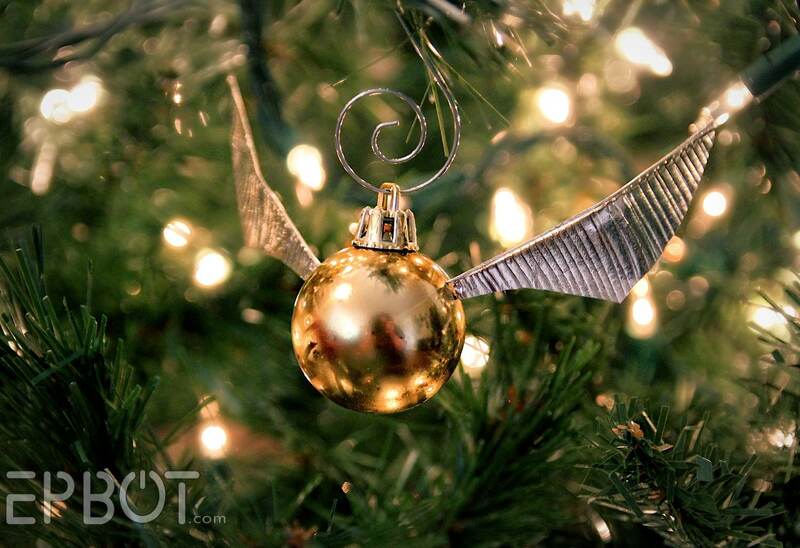 Make Your Own Golden Snitch Ornaments! And the best part? SO CHEAP TO MAKE. And easy! John and I knocked out all 30 in a single evening. So let's get to it! The bottom wire is what I started with, the top have all been straightened. Important: Make sure your drill bit is at the same angle you see my wire here; otherwise, the wire won't feed through properly. I found it was easiest to drill the hole straight down first, and then gently turn the Dremel so the drill bit was at the proper angle, kind of pumping the drill bit up and down a bit as I turned. Once the holes are drilled, feed your wire through. This will be a bit fiddly and may take a minute, but take your time, and try not to bend the wire. Now, prepare the wings! Carefully lay out a large sheet of tin foil (try not to crinkle it), and cut it into rectangles measuring 2 X 3.5 inches each. 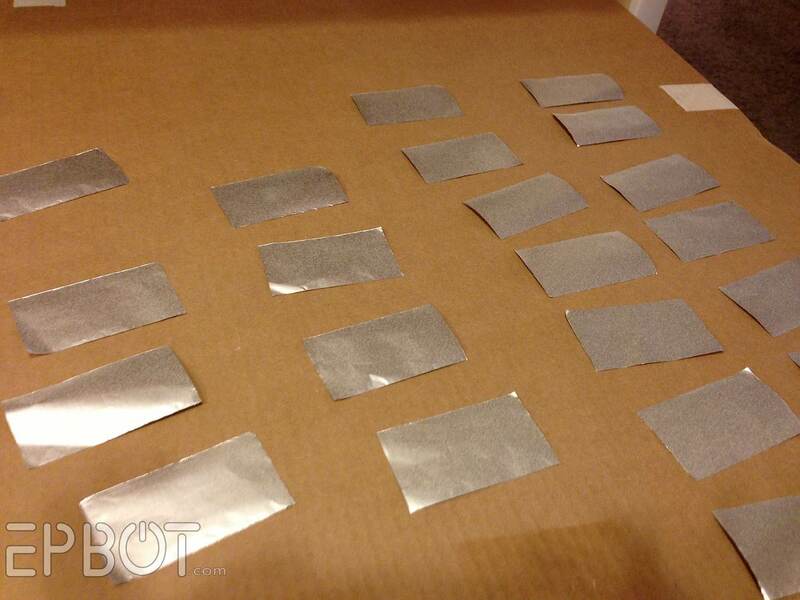 When you have a dozen or so done, lay the foil squares shiny side down, and spray with a light coat of spray adhesive. (What's that, you've never used spray adhesive? GET SOME. You'll find yourself using it for everything!) Make sure you spray outside, though, to avoid fumes and sticky overspray. Alternate: Since some of you just reminded me it's FREEZING where most of you are, you can easily substitute metal tape for the tin foil & spray adhesive. The tape may gum up your scissors a bit, so just have a rag on hand to clean off the adhesive every few slices. Get the foil as close to the ornament as you can, almost touching. Gently press down with the wire (gently!!) 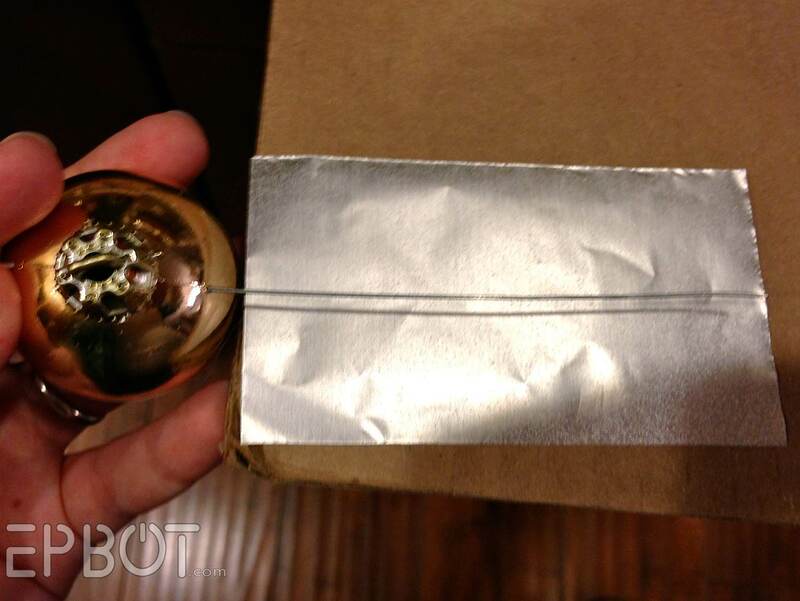 until it sticks, and then carefully fold the foil over the wire. 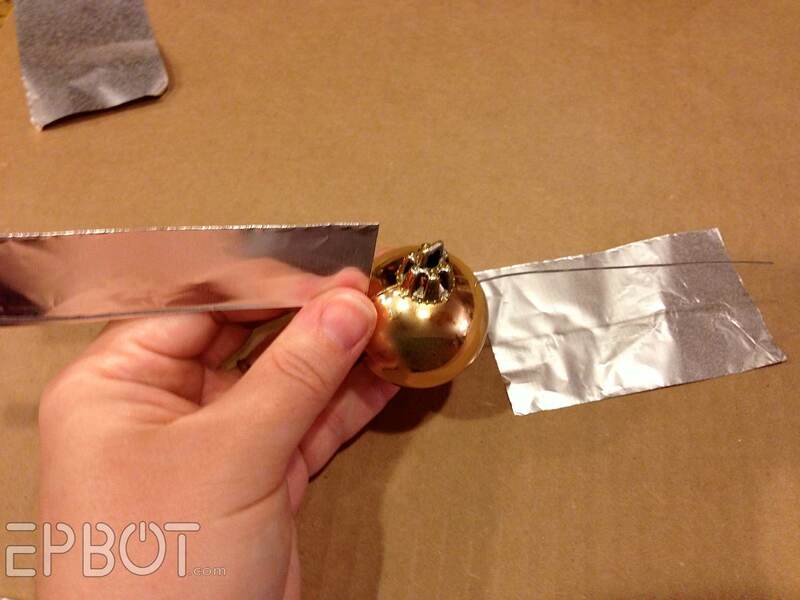 Try to keep the foil as smooth as possible, but don't panic if you get wrinkles; most of those will roll out later. 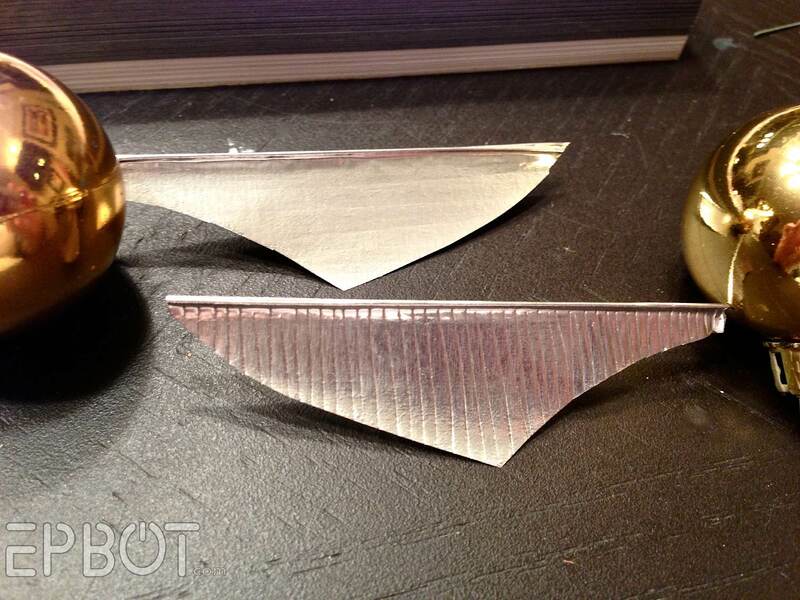 A lot of times your foil won't line up perfectly on the edges, but don't worry about that, either; we're going to be trimming most of that end off anyway. Repeat for the other side of the snitch, but be sure to hold the first wing straight up and down (as I am above) when you do! Otherwise your wings will stick out in different directions. 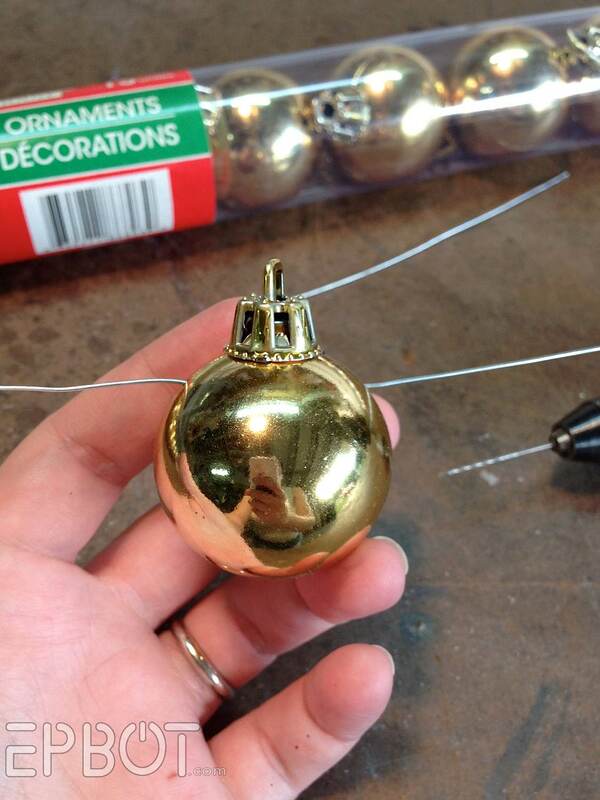 And again, make sure you get that foil as close to the ornament as possible. Almost ready for take off! And so long as you press hard enough, the lines will show clearly on both sides of the wing. 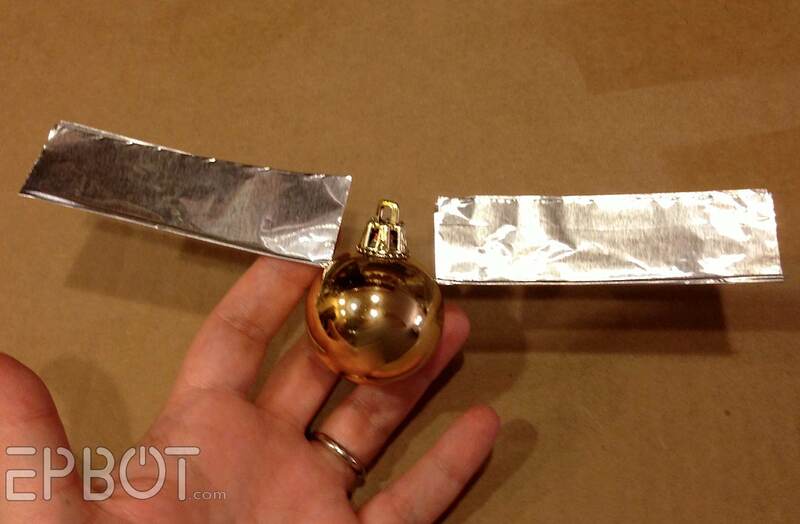 If your foil isn't close enough to the ornament the wings may want to flop down or spin. In that case, either bend the wires up a bit more to brace them, or try a dot of super glue right at the base. And I really like them with those decorative swirly hooks, which we found at Wal-Mart for $1. Having a few different wing positions really adds to the flying illusion, though! 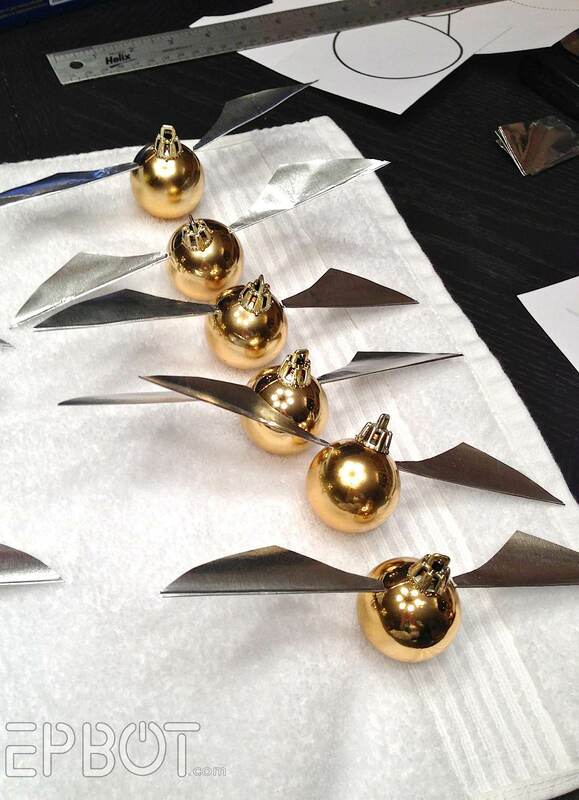 Now go forth, my friends, and unleash your golden snitch hordes!! MWUAH-HA-HA-HAA! Or check my Craft Page for photos of all my tutorials. Enjoy! Those are Amazing. Now I just have to get over my slight fear of the Dremel. I am afraid of A) destroying everything and B) not destroying everything, and then becoming completely addicted to the thing. Every time I hear the big hardware store ad with the Dremel kit for $69 I am so torn . . . . I read that line and thought, "I need to move South.". The high today is 18 degrees, and that's feeling downright balmy. Sorry all, AZ is still in the mid 70s, so we can do this outside as well, but definitely not during the summer - it's too hot then. I am surprised you went with foil and spray adhesive after finding the wonders of foil tape! I thought at first that you'd used foil tape and was shocked you went through the trouble of gluing aluminum foil instead. Any reason for this? The metal tape is quite a bit stickier, so really my only reason was ease of cutting; foil is a breeze to cut with scissors, while the metal tape tends to gum up my scissors after a few slices. That's it, though, so as long as you clean off the scissors, I'm sure the metal tape would work just as well! I tried this (finally!) at home this past weekend and I used the tape. 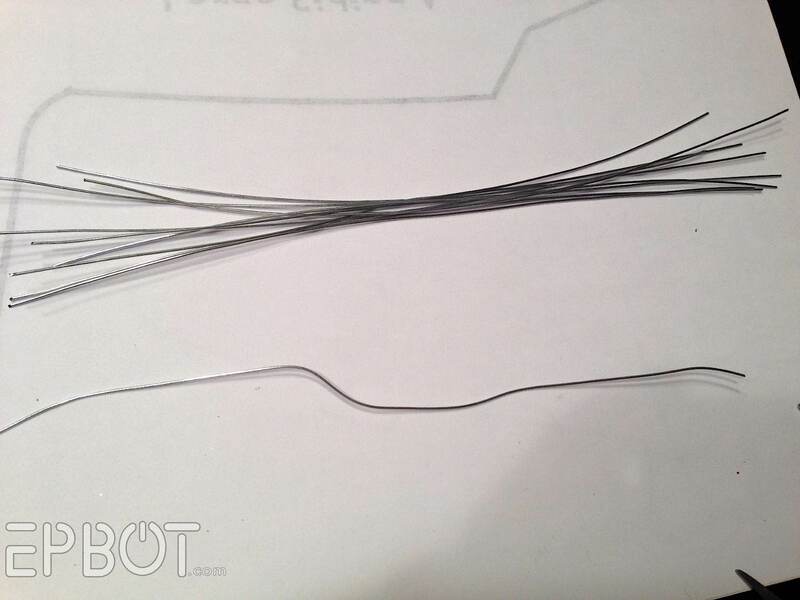 I left the backing on the tape to cut the length (Double the length of your wire on one side) then folded the tape in half to mark the mid-point, pulled the backing off the tape, laid it down on the table and lined the wire along one edge of the tape. I then peeled off the backing from the other half of the tape while slowly aligning it with the first half and pressing to eliminate air bubbles. This means that the tape went down one side of the wire, wrapped back over the end and stuck to itself. I just used a pair of general purpose scissors and had no issue with gumming. Maybe it is a brand issue, I used a generic tape. Probably from Rona, but maybe Home Depot. 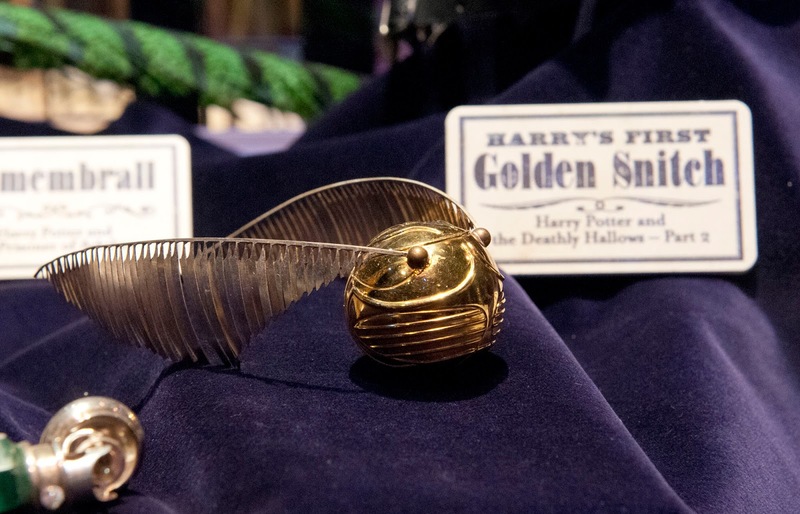 The snitch turned out great, but I need to find a dark gold pen to draw the "face" on the snitch - at least I think it looks like a face. I had rounder wings than you though...I thought it looked off, I'll have to go back and make the curve concave instead of convex near the connection point. Definitely easier to do for us Northerners than spray adhesive though. Only took 10 minutes outside of trying to get the wire through for 20 minutes. I figure if I make more I'll probably get faster at threading that wire. "It was actually pretty fun, since I was dancing around to the radio in the garage at the time. (Pretty sure I'm the crazy neighbor... and I'm ok with that.)" Ummmm, then you and I might be sisters...I've danced around and sang with the radio in our garage while working with an electric sander. That's normal, right? RIGHT???? Jen, AmyLynn, I would say that is completely and unequivocally normal...but normal is boring! Garage craft dance party, y'all!! Jen! These are adorable! Agh. So so cute. I'm positive mine won't get put away after Christmas. Now I just need an explanation ready for when guests ask me why they're ducking through snitches to get to the bathroom. Foil tape can be too thin as wings...LOVE this! Thanks, Jen. You just made it easier to surprise my sister the Potter Head. Thanks for the amazing tutorial! I know what I'm doing over the Thanksgiving holiday! 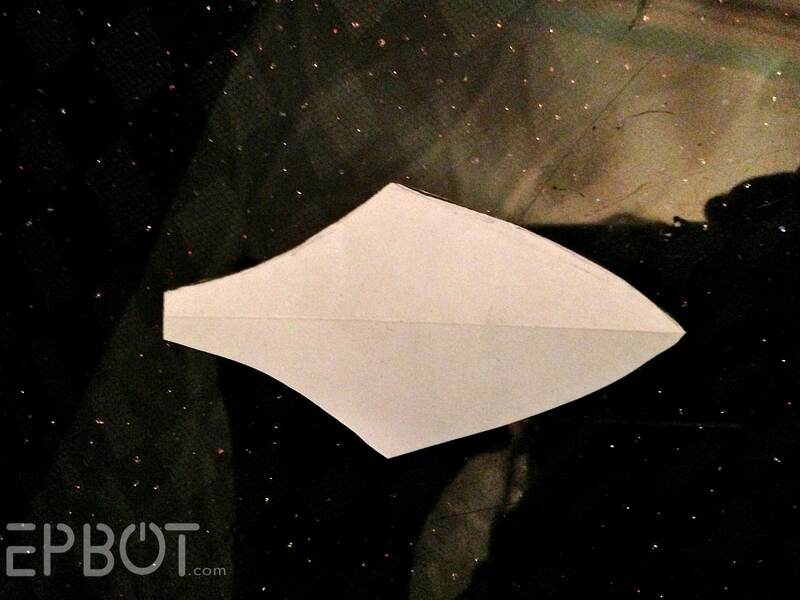 Also..am I the only one that see a spaceship in deep space with the template photo? You know, I've had luck in the past "drilling" through a plastic ornament just using a sturdy thumb tack, so you might give that a try! I thought about suggesting this in the post, but I wasn't sure if it would work or not. If I make more (which is very possible), I'll experiment to see if that's doable. 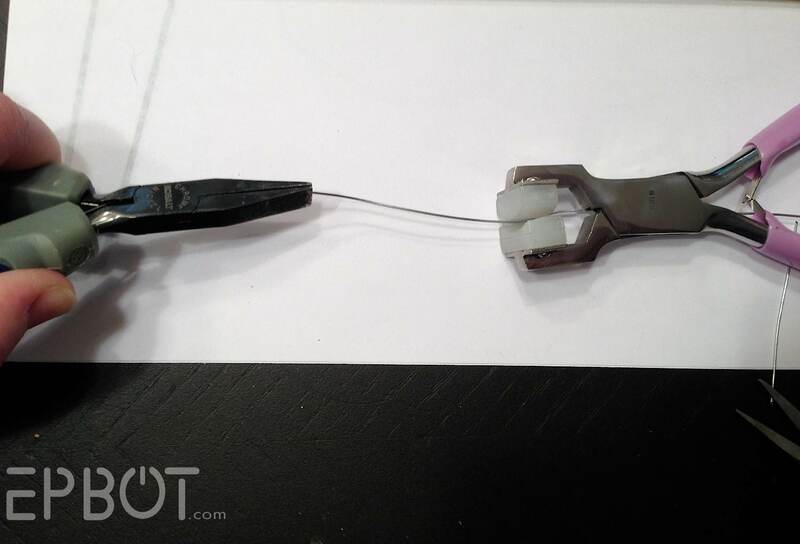 You might also be able to melt holes through by heating up a large gauge wire and pushing it through. Just wear a protective glove and try not to sniff the plastic fumes! I used a craft knife and just spun it in circles until I'd drilled a little hole. Have you considered using a comb to make the lines on the wings? That might make it faster, allowing you to create all the lines in one stroke using the teeth of the comb ... assuming it works; sadly I don't have any foil at hands to try. I'm sure it would work; you'd just need a really fine-teethed comb, or to do a few passes with it. It only took me a few seconds to do each wing with a scrap of wire, though, since the faster you go, the straighter your lines tend to be. Plus I kind of like the not-quite-perfect lines; they look more detailed somehow, less manufactured. Umm...you already have your tree up??? I'm thinking the coming grandbaby may need a Snitch Mobile! Thanks for the tip! Now I will have to try it!! And now that I think of it, I do have a sharp poke-y type tool that I use sometimes for paper crafting...it might work, too. The 9 yr old girl I babysit after school is obsessed with Harry Potter right now and re-did her room in a bright orange-pink Harry Potter meets My Little Pony theme, and I'd love to give her a bunch of these to hang from her ceiling. Hmmm...I wonder if I could even do these with her...I bet she would love them even more if she's had a part in making them! Looks like a trip to Dollar Tree has been added to my to-do list for tomorrow! She sounds like someone for Jen's exemplar posts! Between Jen and John, do you think it's possible for them to resist a Harry Potter/My Little Pony mash-up? Sweet StayPuft, that has to be a new record! I've never seen someone use one of my tutorials so fast, and it looks PERFECT. Just showed John; you get high-fives from us both! Now, get some larger ornaments and make your own Bludgers and Quaffles for a HP tree! Jen, every time I think you've done your cleverest craft, you top yourself! This looks really, really cool and so easy! Thanks for sharing!! 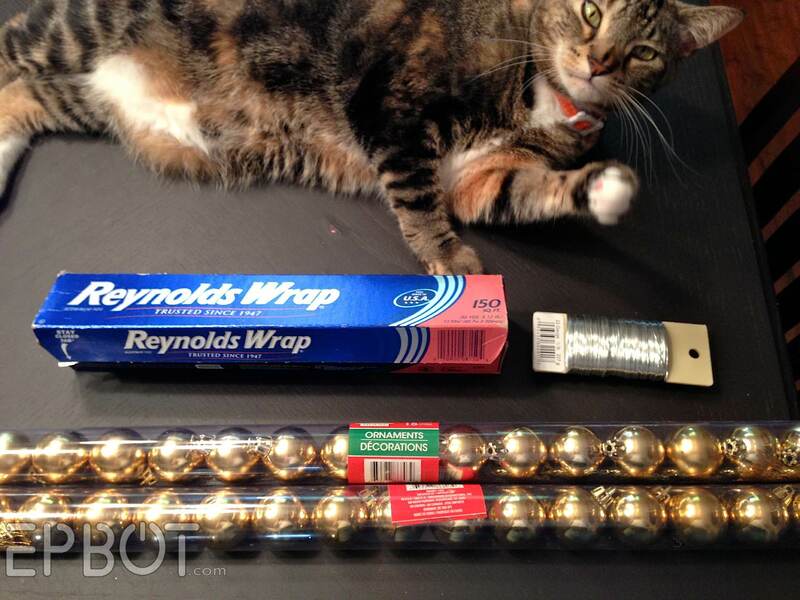 For those of us who have cats, any project has the same first step and it's not optional. The only part you missed is the cats' proximity to the project (i.e., should be right in the middle not simply next too). Love, love, LOVE this tutorial! We don't have a Dremel (yet, as the husband keeps reminding me) so I'll try the thumbtack approach because I'm a HUGE HP fan and have wanted to make snitches for forever! Also, thank you for the Princess Bride throwaway quote. It's one of the most used quotes in my house! These snitches are freaking awesome. Can't wait to see the whole HP tree. It's going to be amazing. 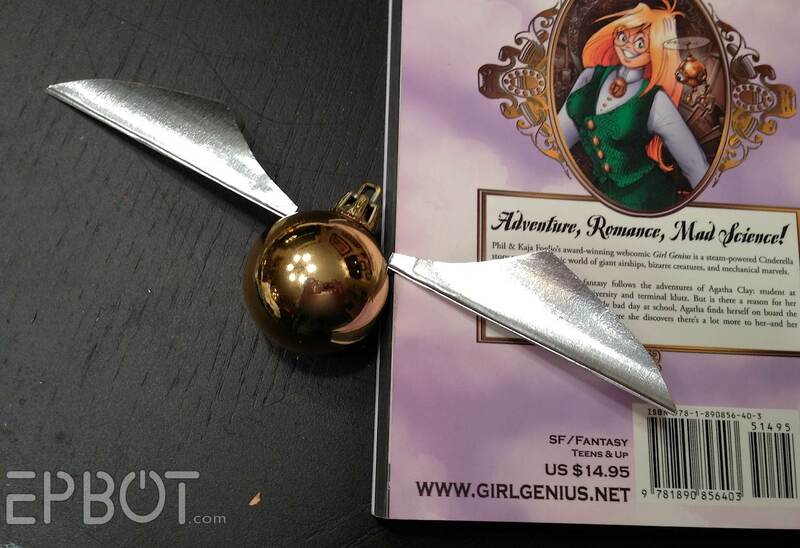 Girl Genius! Our world's collide! We just got the 13 issues of the graphic novels thanks to a Kickstater campaign and are reading like crazy. Are you doing a whole Harry Potter themed tree. Please say yes! I want more HP themed tutorials. So how will you store these for next year so the wings don't crumple? I'm planning to store them all in a small box, to keep them from getting crushed. *Tweet*! Penalty to Jen Yates for unnecessary qualification! So...I love these and bought everything to make them. I'm really excited. But I can't get the wire to go through both holes. :( Any advice?? Just kidding! I got it to work! :) Halfway done. 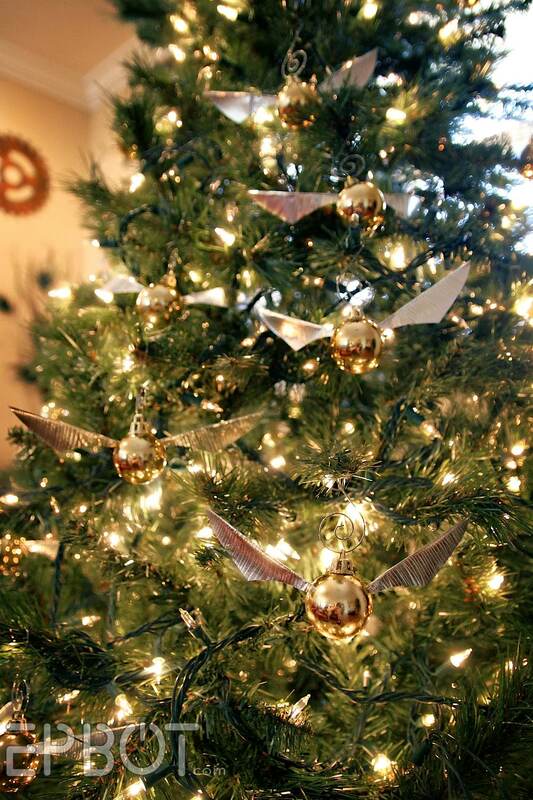 Still have to buy a tree to make my Snitch-mas Merry! With a different color and minor modifications to the wings, I can easily see this becoming Navi the Fairy from The Legend of Zelda: Ocarina of Time. Great tutorial. Also, if you are wondering about increased traffic to your site, ThinkGeek shared this tutorial on G+. I love it when geek worlds collide! You could use this same technique to make little bats. 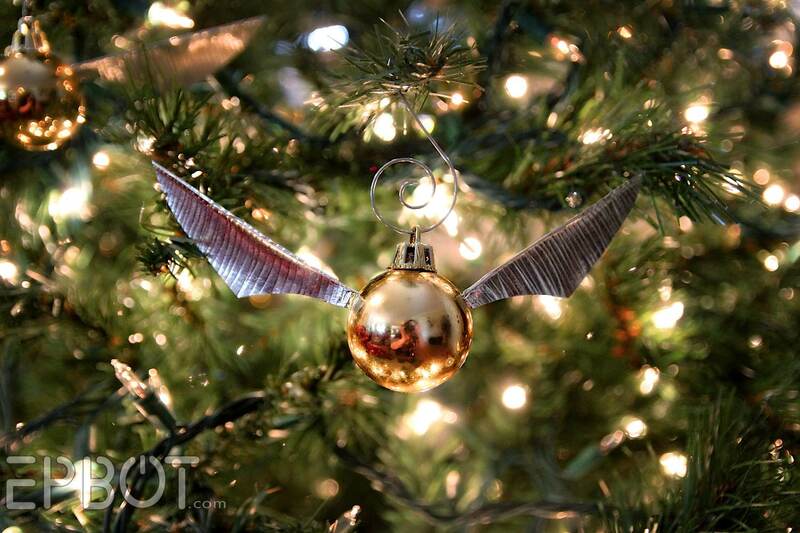 Just use black ornaments and spray paint the foil black, and make the bottoms of the wings jagged. I just spent 5 hours and got ten of these done. They've turned out so cool that I don't even care. The one thing I changed was that I cut the wing shape before I glued it to the wire. I was having a hard time holding the ornament, the template and cutting a decent shape. I have tiny hands though, so that's probably my issue. 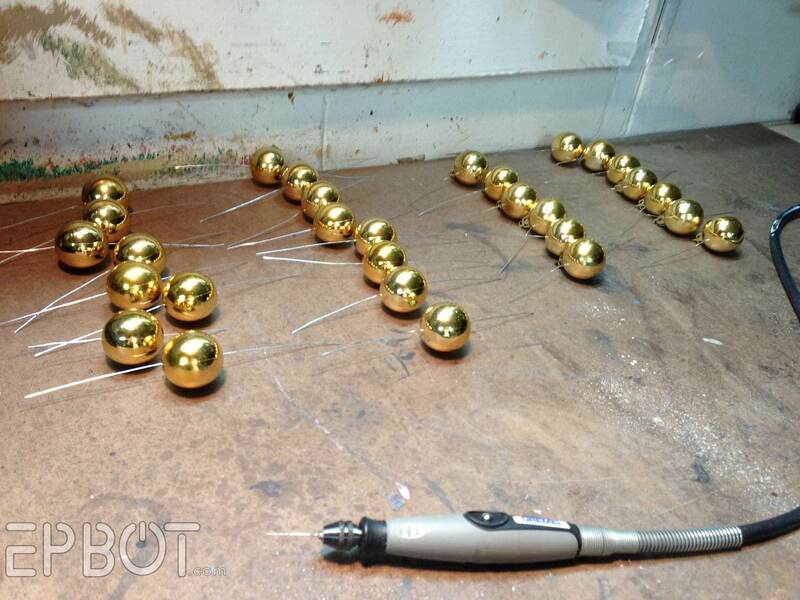 "Drilling" with a pushpin works just fine. Three of us made 16 of these last night in our own "penny blossom"-esque assembly line and had a blast! (thanks for the retweet, btw -- that made my morning) I just realized we left the wings upside-down...guess there's more work to be done! I share your tutorial on my Harry Potter Page !!! Thanks for sharing !!! Hubby and I just finished making some snitches for our tree - so fun! Thanks! These are amazing... and you have a cat named Tonks?! So glad I found your website!!! My First Visit To Hogsmeade & Diagon Alley! The Best Epic Rap Battle of History... EVAH! How To Fix Frizzy Doll Hair - Perfect for Ponies! Halloween Reader Show & Tell!